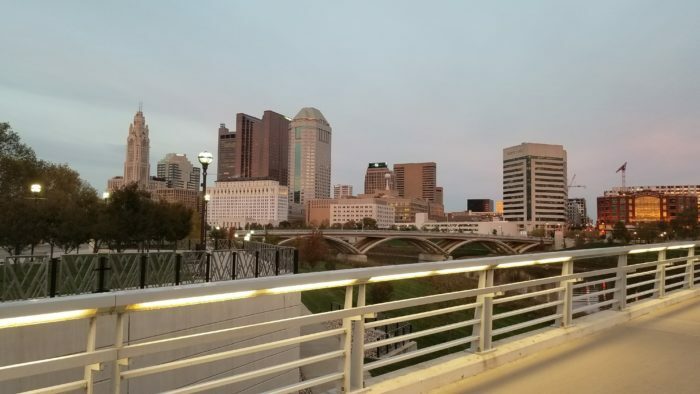 If you’re looking to enjoy the best views in Columbus in a relaxing evening stroll, look no further than what I like to call “the Scioto Mile loop.” This is an easy walk that anyone can enjoy; it’s only about 1.5 miles (and you can take shortcuts). 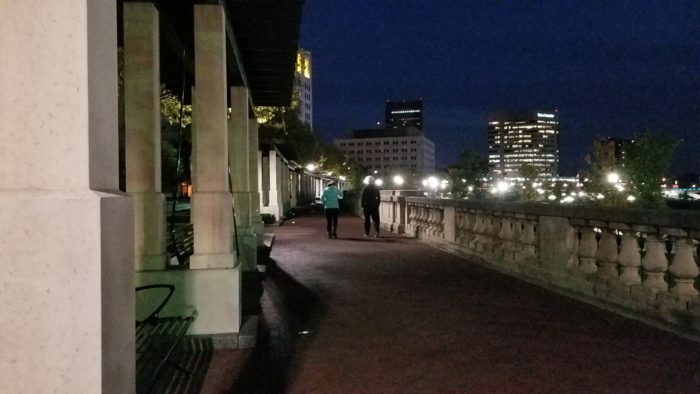 This trail will take you past through the Scioto Mile Promenade, Genoa Park, the Bicentennial Park, and several bridges, including the beautiful Main Street bridge. 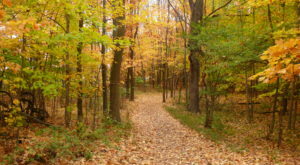 You can start your stroll anywhere along this loop. Some of the easiest places to park are along Washington Blvd. 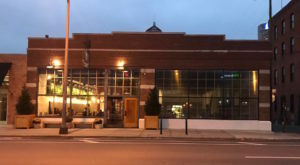 (the street that passes by COSI), or on Main Street. If you park on Main Street your first destination will be the Main Street Bridge. The Main Street Bridge was built in 2010. This bridge is the first in North America and the fifth in the world to use an inclined single-rib-tied arch superstructure. It has a separate driving and walking area. 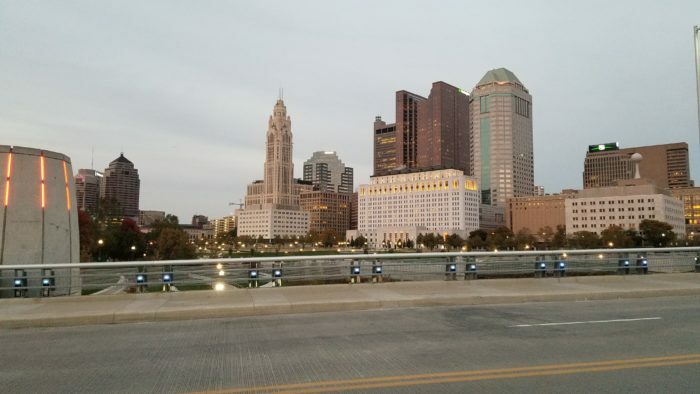 It's a fun place to watch the sun set over Columbus or watch the Ohio State crew practice on the Scioto River below. Make your way up Washington Blvd. You will arrive quickly at the Rich Street bridge. This is the bridge that has beautiful blue lights on it's side, which reflect wonderfully in the river in the evening. Walk to the middle of the the Rich Street bridge. We're not crossing to the other side yet, but there's something very special sitting on the bridge. It is one of the Terry Allen's deer sculptures. 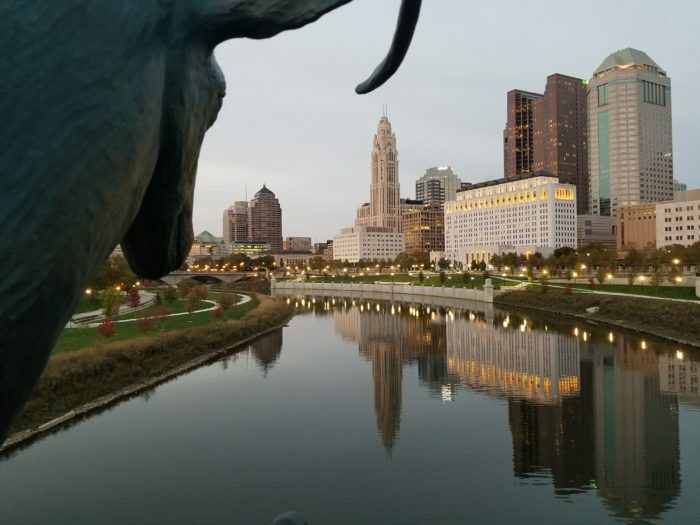 The sculptures are unique and human sized, so that you can feel like you're admiring the Columbus skyline along with the deer. If you'd like a shorter walk, you can cross to the other side via this bridge. 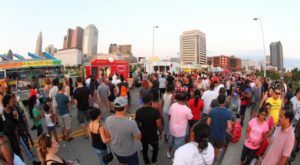 Continue to make your way north and you will get to Genoa Park. 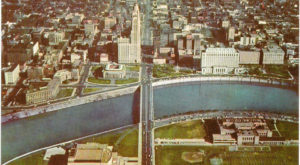 The Genoa Park sits in front on COSI. 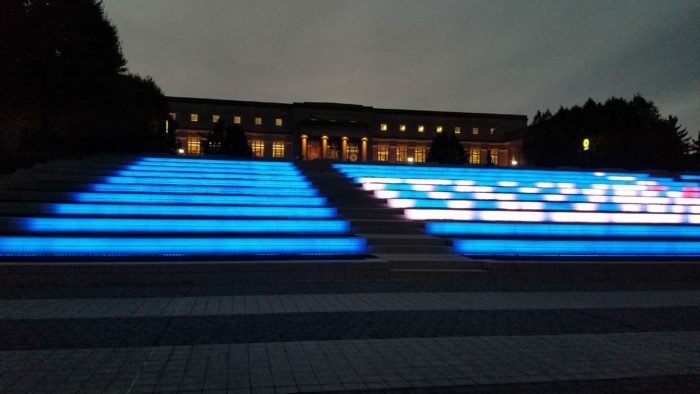 It has a wonderful grassy area, several small fountains, and beautiful wide lit steps. 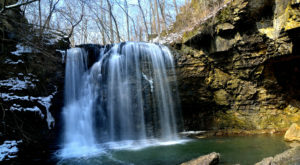 Many festivals and music performances take place here in the summer. What do the step lights spell out? You'll find out later. You will find two more deer sculptures at the Genoa Park. The Genoa Park also holds two more of Terry Allen's deer sculptures. One sits on the top step and admires yet another stunning view of the city's skyline. 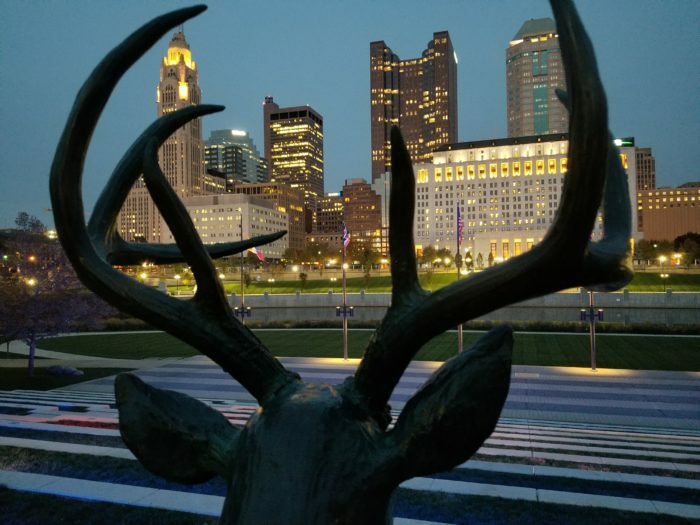 If you stand behind the deer, it will look as if he's holding the city in his antlers. The other deer is relaxing in the grassy area of the park. Can you find him? Next, head to the Broad Street bridge and make your way across. This bridge offers a couple oval shaped lookout spots from which you can enjoy the view. 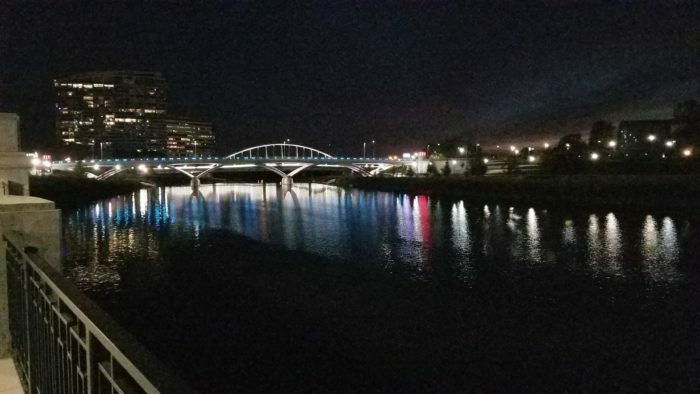 You'll see the city's night lights reflecting in the Scioto River. As you keep walking, you will see the historic Leveque Tower get closer and closer. Read about this iconic tower here. 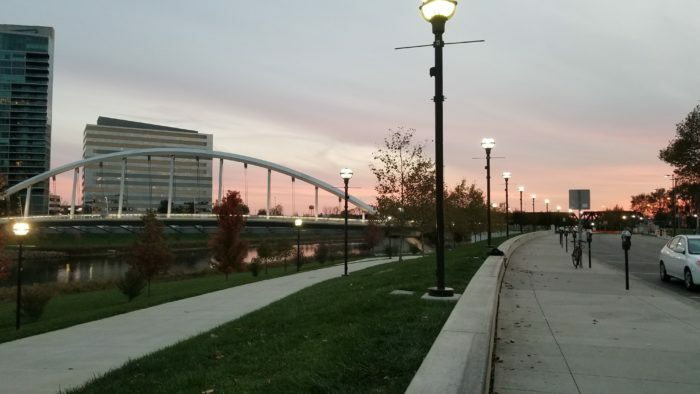 As soon as you cross the bridge, you will find yourself at the Scioto Mile Promenade. This stretch of the stroll will take you along Civic Center Drive. The promenade holds a long colonnade of benches and swings. Yes, there are wonderful swings, from which you and your loved ones can enjoy the evening and the views. You'll get a view of Genoa Park as you walk down the promenade. 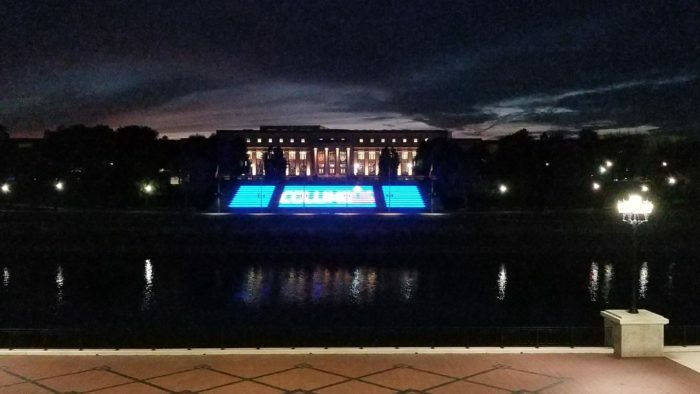 Can you tell what the steps spell now? Of course! It's the official Columbus logo, with the emphasis on "us." Make your way back towards Main Street to finish your stroll. 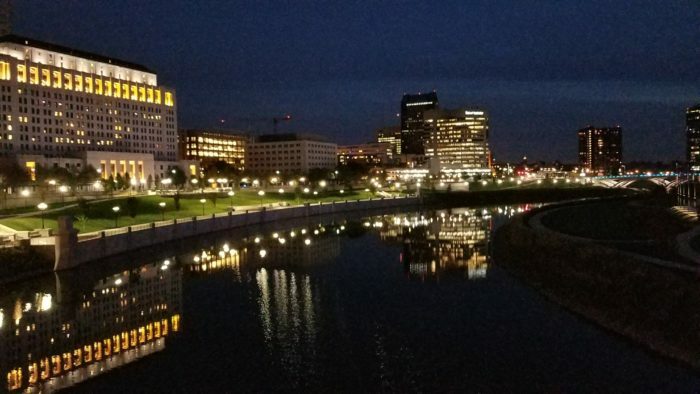 Enjoy the reflecting lights in the river as you walk back to your starting point. 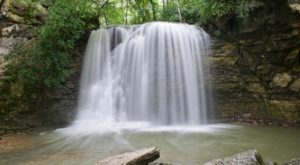 You'll walk right past the Bicentennial Park, whose fountains operate in warmer months. 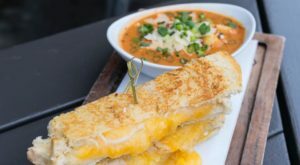 If you're hungry, you will also find yourself right next to Milestone 229. Both the restaurant and the fountains are an excellent way to conclude this scenic stroll. 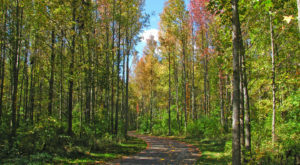 Are you ready to set out on this scenic stroll? Let us know what your favorite part was!